Seventy-five million miles out in space is not where you want to be when an emergency crops up, but that's exactly where NASA's Kepler spacecraft was earlier this week when the red lights and sirens went off back at mission control. Kepler suddenly placed itself in "emergency mode," for reasons under investigation. Mission operators at Ames Research Center in Mountain View, California were given immediate priority to use NASA's Deep Space Network of radio dishes to communicate with Kepler and download data to help them diagnose the problem. Despite a 13-minute round-trip communication delay, project engineers managed to get Kepler out of emergency mode and placed the spacecraft into a stable waiting state, as they analyze the diagnostic data and figure out what happened. 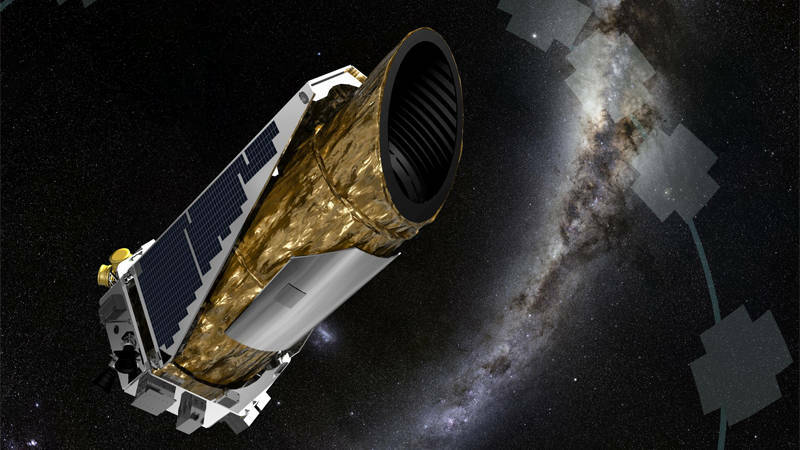 Mission managers hope to return Kepler to science operations soon, once the spacecraft is given a clean bill of health. Kepler is a sun-orbiting space telescope designed to discover small, Earth-sized planets orbiting their stars at the right distance so that liquid water could exist on their surfaces—planets within their stars' so-called "Goldilocks Zone," or Habitable Zone. Since its launch in 2009, the Kepler spacecraft has detected and confirmed about 1,080 extrasolar planets, and 4,966 candidate exoplanets awaiting confirmation, adding greatly to the totals of all exoplanet discoveries. Of these detections, about a dozen are smaller than twice Earth's size, and orbit within their stars' Habitable Zones, making them prime prospects for possessing life-friendly environments. 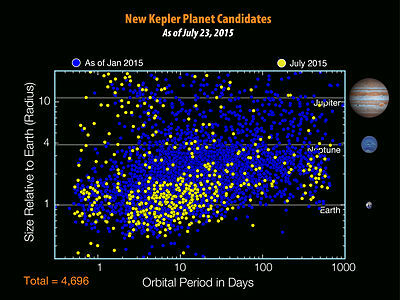 Kepler was preparing to begin a search for distant exoplanets through measurements of their effect on the light of more distant stars, a science campaign that was to begin on April 10th. As an exoplanet passes between Earth and the more distant star, its gravity can bend the star's light and focus it toward Earth, causing a distortion in the starlight that Kepler can detect. This effect is called "gravitational microlensing," and is similar in concept to how a glass lens bends and focuses light, but on a much larger scale. Gravitational microlensing, then, lets us detect the presence--as well as estimate the masses--of planets so far away that they are normally undetectable. The most distant exoplanets yet discovered were detected by this method, some as far as the central core of the Milky Way Galaxy, tens of thousands of light years away. The detection of exoplanets by gravitational microlensing was not Kepler's original method of discovery. Kepler's initial exoplanet-finding tactic was to measure the dimming of a star's light as one of its own planets crossed in front of it, an event called a transit. Kepler spent three years staring at about 145,000 stars near the constellation Cygnus, waiting for any of them to "blink" as a planet transited. By "staring" at the same patch of stars for multiple years, Kepler was also able to confirm planets at Earth-like distances from their stars—planets that we can only observe to transit once in many months, or years. But in 2012, one of Kepler's four stabilizing gyroscopes stopped working, followed in 2013 by a second gyroscope failure. The loss of these gyroscopes meant that Kepler could no longer remain pointing steadily at its target patch of space, and continued observations of planetary transits could no longer take place. Then in May of 2013, a new operating mode was approved that would allow Kepler to continue conducting scientific investigations using only its two remaining gyroscopes. In its K2 incarnation, Kepler can conduct a number of observations, including detecting exoplanets through gravitational microlensing, searching for supernovas in distant galaxies, and studying young stars in clusters to expand our understanding of how planetary systems form. With any luck, K2 will resume science operations in a week or so, bringing to knowledge yet more strange and distant worlds.